Welcome back to the blog! Last July I mentioned that I had just signed up for Tailwind. 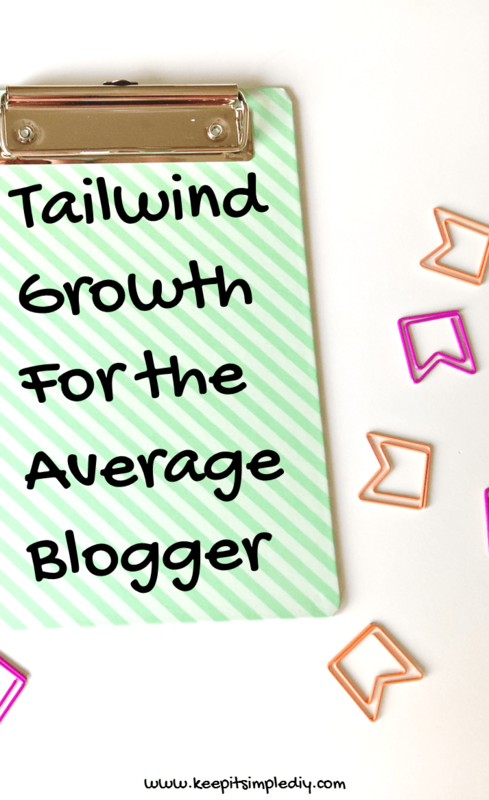 I’ve now been using Tailwind for about 8 months and have definitely seen growth. I decided to write this post because I see a ton of posts showing how bloggers grow so much in just a couple of months. Many of those posts are quite misleading though. Perhaps the blog is new, but the blogger is well seasoned. Or, the blogger spent hours upon hours working on their blog during those months. I’d like to say I’m an average blogger. I keep the time I spend on my blog to a minimum. Typically I spend about 10-20 hours on the blog during the month. Many bloggers rack up 10-20 hours in just days. The graph below shows referrals to my blog from Pinterest. As you can see, I had less than 100 page views on my blog from referrals on Pinterest prior to using Tailwind. If you would like to see my overall stats for any specific month, you can find them here. Once using Tailwind, I started to see some growth. In July, I started scheduling my repins and saw a small increase. I also joined quite a few group boards and saw a huge increase in August. Of course, growth doesn’t happen all at once so I had a dip for September. I stayed pretty consistent through December where I had a huge spike. Each time there is a huge spike, I did something differently. I either joined more group blogs, increased the amount of pins I post per day, or had a better posting schedule. One of the main things I started doing is re-pinning my own pins to all group boards they are relevant to every three months. I made a spreadsheet to help me keep track of which to post when. I started pinning about 25 pins per day in August and by December was at 30-35. Now, I’m not much higher at 45. Many people pin 50 or 100 times per day but I haven’t been able to get myself there. I imagine once I get there I will see a bit of a jump. I have seen another dip since December but I anticipate it will go up in the next few months. So, for the average blogger, success doesn’t happen overnight. Some great growth is still possible though. I went from 100 to 800 views in a month from Pinterest referrals and it only took 6 months. Do you have any Tailwind strategies? I’d love to read them in the comments! If you haven’t tried Tailwind, try it free using this link. Thank you for busting the behind the scenes about all these different posts. Will be trying this out. One thing I love about Tailwind is that it tells you if you’ve already pinned something to a board and when it was pinned. I was keeping track of everything on spreadsheets before I got Tailwind! It really go out of hand as I made more and more pins and joined more group boards. Tailwind keeps me sane. I’ve tried Tailwind and it’s definitely useful and pretty straightforward. I just find that Pinterest isn’t that helpful for growing my audience because I don’t share a lot of recipes or how-tos on my blog. I mostly write about politics and entertainment. Any advice? Yes, find group boards about politics and entertainment and request to join them. Then pin your content to those boards and repin from those boards. You will start to see a spike in traffic. I’ve read a lot about Tailwind lately and will hopefully be testing it soon myself! How do I get involved on these group boards? Go to a blogger you like and look at the group boards they belong to. If you go to mine, you can see that all the group boards have photos that don’t match my general theme. pinterest.com/keepitsimplediy Then, click into those groups and they have instructions on how to join. Some say to email a certain address, or comment on a certain pin. Other’s aren’t open to join. Hi thank you so much for your reply! I will be looking into this 🙂 I love how you’ve themed your boards too! I am so exciting for this. Thanks for sharing. I have Boardbooster. I noticed a spike in followers since getting it. I haven’t gotten into Tailwind much, but will look into it. I love Boardbooster’s feature of finding pins for you. That way, I don’t have to spend a huge amount of time looking for other blogger’s pins to pin to my boards. Tailwind is something I’ve been meaning to look into but haven’t found the time to do it yet, thanks for your insights! I;ve heard great things about Pinterest and blog traffic! Congrats on the Pinterest growth! Using a scheduler for Pinterest is such a time-saver, and it’s a huge boost when it comes to growing a followers. I need to jump on Tailwind. It keeps getting pushed back on my long list of things to do! Pinterest has always been one of my biggest traffic sources, but I’m just getting into Tailwind further and I really like it so far.